No idea why I keep getting images like this all of a sudden. ASI294mc pro on an ED80.... This is 22x 300s and I figured I'd get way more data than this. I did an hour on the Crescent Nebula about 50 feet from a street lamp and got better than this. I used a Duo narrowband Filter and I'm wondering if I may need to scrap it and just stick to my CLS-CCD. It's still pretty good, if you squint away the pixelation. I've done far better on this target before. You mentioned pixelation. You're meaning undersampling or oversampling? Edited by TeamHawkins, 09 March 2019 - 01:23 AM. Just that the stars' images seem to be composed of many "squares." I know that you could do better (and you say you already did), I was just trying not to disparage your efforts. I could tell that I was looking at the Pleiades. Far simpler answer...don’t use an emission line filter on a broadband target. Reflection nebulae are broadband, so you are heavily attenuating the light from the Pleiades. And can we stop with this over and under sampling thing like it’s gospel. Not sure if you're talking to me about under or oversampling. I was asking what he was referring too. I don't use those terms at all actually. 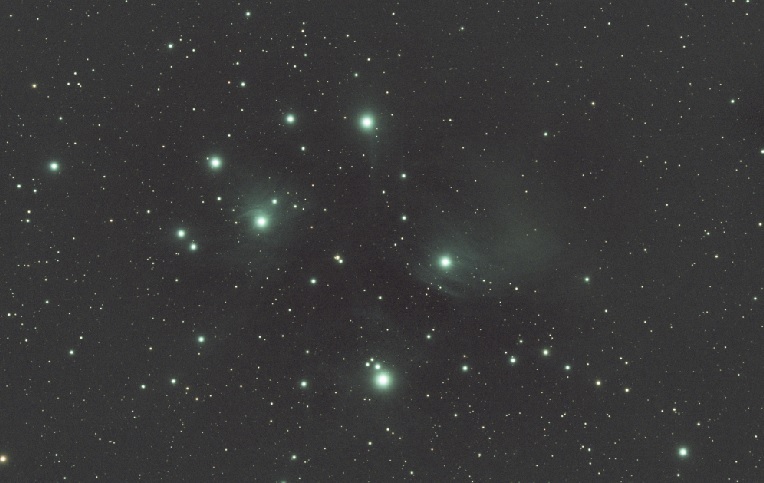 I've seen many great images on M45 with Ha filters. Same with Galaxies. I'm not concerned with being told how to image, I'm concerned as to the post processing result. I have yet to purchase the high end software but it seems I may have too. The issue with the image is using the narrowband filter on a reflection nebula, which is a broadband source. Go back to using your LP filter and your problems will go. Narrowbandpaul is absolutely correct. The Duo filter is intended for EMISSION nebulae which emit a series of narrow lines of hydrogen and oxygen. M45 has a REFLECTION nebula which emits broad band light from nearby stars, and that mostly in the violet and blue region because longer wavelengths tend to pass right through a gas cloud with little scatter. Read about Rayleigh scattering. The narrow 500nm band of your Duo filter is the only one which picks up reflected light, and that to a minimal degree. On reflection nebulae you will get much better results with the CLS-CCD filter, which has a much wider blue-green bandpass. There are no great images of reflection nebulae done only in Ha. There are images of some galaxies done in Ha, but they only show Ha emission regions. Great images of galaxies are usually done in OSC or LRGB plus Ha, where Ha shows starburst activity. I'm not here to argue but you're 100% wrong. Wrong about what? He is pretty much 100% correct. So reflection nebulae are scattering (changing the angle) of the incoming starlight proportional to the inverse 4th power of wavelength, this is the Rayleigh scattering mentioned above. Reflection nebula are blue because the light you are seeing has been scattered through a large angle and only blue light scatters to large angles. Same reason the sky is blue and sunset is red. A narrowband filter is designed to have high transmission at one or these days several emission lines, notably Ha, O3, S2, Hb. It has low transmission away from these so it attenuated very well LP (normally the sodium line). Because it has a narrow band pass it also attenuated quite well a broadband source. Imagine a filter that has a square transmission spectrum, say 0% out of band and 100 % over a 10nm region. Imagine imaging a broadband source, which emits uniformily over all visible wavelengths. The broadband photons from the source that lie inside the peak transmission of the filter will make it through, but that’s photons over a 10nm window, vs without the filter the entire visible spectrum, 300nm wide. So the change in amount of light let through is reduced by a factor of 30. This is is what is happening with your Pleiades image. Some light will get through as it’s a broadband source, but it will be attenuated heavily by the band pass of the narrowband filter. The great thing about facts is that they continue to be true whether or not you believe them. You came here asking why your Pleiades image was below par, you received an answer about 4 times. You posted asking for help so perhaps take on board what has been said. Finally, if you disagree with something, your statement of ‘you’re a 100% wrong’ is fairly useless without explain why you think we are wrong. But of course you are welcome to use a narrowband filter to image the Pleiades if that’s your thing and forever wonder why your images don’t turn out as you expect. Edited by Narrowbandpaul, 09 March 2019 - 05:16 PM. Yes, go back to the CLS-CCD for reflection nebula. As others have pointed out the Duo Narrowband filter is blocking out the spectrum that you want to capture for this one. The Crescent Nebula is an emission nebula. That is why the DUO Narrowband worked for you on that one. I re-calibrated and stacked the images in Pixinsight, and it came out much cleaner. End of story. The image might have come out cleaner with a new process but that filter still blocked out the majority of the signal coming in, wasting a lot of time. You should re-read some of the replies above again as they explain this fairly well. Knowing the right filters to use on objects is part of the game. There's no need for the attitude. Here's what's going on in the Pleiades and other reflection nebulae. The light seen from the nebulosity is light from the stars scattered off of interstellar dust that surrounds the stars. The stars of the Pleiades are extremely hot (10,000-20,000 K) and thus have blackbody peaks of their spectra below 300 nm (so, in the violet to ultraviolet). However, their blackbody spectra are extremely broadband, so they emit light throughout the entire visible part of the spectrum, but rising toward the blue because of their high temperatures. This starlight scatters off of the dust. This scattering is governed by the Rayleigh process, which is wavelength dependent such that blue light scatters more than the red. Thus, the light scattered impinging on the dust is already dominated by blue light from the stars, and this gets enhanced by the Rayleigh process. This is the same process that gives us our blue sky. There is no Ha emission, or any significant line emission from the nebulosity in the Pleiades, because there is very little gas there. The hydrogen gas originally around the stars has been blown away from the radiation pressure of the intense starlight. That's why we just see dust scattering. Yes, there are red photons, but these are just from the scattered starlight that happen to have the same wavelength as Ha and are simply part of the overall scattered continuum. The attached spectrum from the source provided below shows a spectrum from the Pleiades. No lines to speak of, and rising toward the blue following the Rayleigh curve. The light at 500 nm ("O-III") is about 2.7 times brighter than "Ha", and it's much brighter as you approach 400 nm. So, a duo narrow band filter that passes light at O-III and Ha will have color at both these wavelengths from the Pleiades, but the "O-III" part should be almost 3 times brighter than the "Ha" part. The filter is just sampling two intervals of a very blue-dominated continuum spectrum. A broadband filter will pass more of the light below 500 nm and lead to very blue-dominated images, which is more indicative of the actual light coming from the Pleiades nebulosity. As human history shows, reason has no chance against conviction. And, there is no law to prohibit imaging violet wavelengths with a narrow-band Ha / Oiii filter. With enough persistence, I am sure you are about to discover SOMETHING. The blue would have come out even more fine in the trifid had you not used a narrowband filter to image a broad spectrum target. Now to the hostility, referring to people who try to help as know it alls is quite insulting. Many on here have extensive imaging backgrounds, technical and in my case at least an astrophysics background. We understand the difference between emission and reflection nebula and what filters should and should not be used. This is not a difference you understand nor try to understand despite posting asking for why your M45 was lacking. We told you, categorically what is wrong. There is not one chance we are wrong. The well known science of the situation guarantees us our explanation is correct. Perhaps not, he didn't seem convinced. I'd just capture a few seconds of data without filter and with filter and move on after I had the answer ..... lol Or hold the filter up and look at Pleiades.